I bought two bags of Lemax Christmas village trees. I also bought two (3 to a pack) pack of medium sized trees at Hobby Lobby. 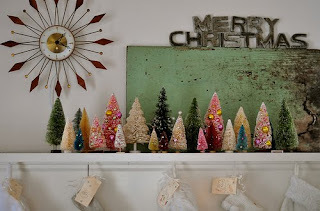 I have also seen miniature trees at Dollar Tree. Michaels and Kmart also carry the Lemax trees. I bought mine off of Ebay for $10 a bag plus shipping. I wanted a variation of heights, so I found that this bag is the best for quantity and price. Next, pour bleach in a bowl and place the trees in the bowl. You do this to get the dye off the trees. You really don’t have to bleach them if you don’t want to. I bleached half of them and the other half I didn’t. It does change the color of the glitter though. If you use darker color glitters it doesn’t matter, but if you don’t bleach the trees the lighter color glitters won’t look as good. Wash the bleach out of the trees and let the trees dry on a dishrag. Since I wanted to add some bling to some of the trees, I went to Hobby Lobby and bought miniature ornaments and some berries. If you can go when Christmas stuff is 50%, it’s really cheap to get all this stuff. I got the package of glitter at Michaels. I went this route because I wanted many different colored trees. I used a 50% off coupon so it was really cheap ($8 I think). To add glitter to the trees, first, take the little stands off the end of the trees, then find some pliers or something to grip the end of the tree. Next, spray either spray adhesive or spray-paint all over the tree. Then dump glitter all over the tree while rotating it around. Shake any excess glitter off, then put the stand back on the tree and set it aside. REPEAT this step for all the other trees. Now, you can add the bling... Hot glue the mini bulbs/berries to the tree. I only did this a few of the trees. Finally find somewhere to display them. Arrange them so the different sizes are mingled together. I also made the Merry Christmas sign behind the trees. I like it, but I may figure something else out… It’s fine for the mean time. They are gorgeous!! I want them . . . ;) I promise I won't steal them though. I absolutely LOVE this. I have it on my pinterest board and can't wait to make them. I love the pink ones. These are amazing!! What fun colors and great tutorial! oh my gosh, how fun! i would never think to buy them in bulk like that and paint them myself! great idea! Thank you so much for this tutorial!!! I have wondered where people are finding these beautiful color bottle brush trees and I can only find green!!! Off to Michaels! Thank you so much for posting this idea! I just love the way they came out. And I love your whole blog too! I love these! So cute!!! Great tutorial. Your trees are adorable! I love all the colors! I found you through Someday Crafts. Thanks for sharing! Oh my goodness! These are ADORABLE! I love it! Definitely doing this next year! The colors are amazing!